This Pool/Shower chair is guaranteed to provide you with a safe, comfortable, and easy bathing experience. A 5 year warranty on the frame ensures that you will enjoy many years of use from your shower chair. Non-rusting Design for Pool & Shower Environments. Sliding Footrest - Swing Out Armrest for Lateral Transfers. Four balloon flotation tires give the chair extra stability that resists tipping. 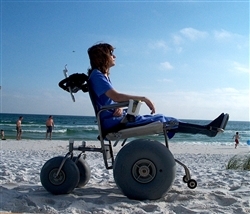 All-terrain, specialized beach wheelchair that allows easier access in sand, snow and other soft soils. Folds flat without tools for easy transportation! For use in aquatic environments with a powder coated stainless steel frame to resist corrosion. 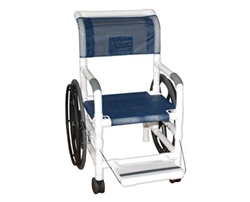 The rigid roto-molded plastic seat aids in user transfer by providing a stable platform. Pool and Beach Wheelchairs are meant for terrain that most other wheelchairs are not designed to handle. 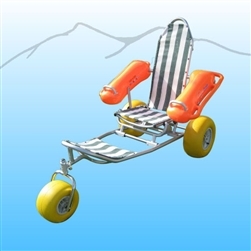 These chairs can be constructed of PVC, can have big rubber tires for maneuverability in the sand, etc.